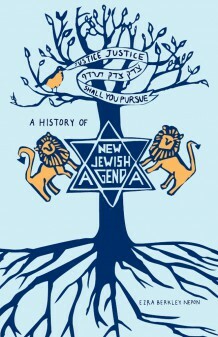 IMA student Ezra Berkley Nepon has had a busy year first with the publication of Justice, Justice Shall You Pursue: A History of New Jewish Agenda and a consequent book tour that brought together Jewish activists from the 1980s with younger activists in Jewish and Queer communities. Continuing to bring together Queer and Jewish communities in and beyond the Philadelphia area, Ezra will next be participating in an evening of “New Queer Jewish Writing” with writer Dan Fishback 6 p.m., Sept. 11 at the Arts Cafe in Philadelphia. 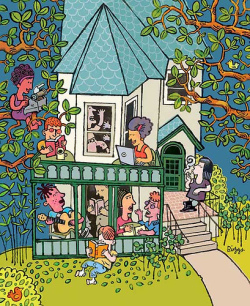 Cosponsored by Creative Ventures and the Wexler Fund for Programs in Jewish Life and Culture, the event features recent writing by each of them. Ezra Berkley Nepon’s creations include the full-length play Between Two Worlds: Who Loved You Before You Were Mine which used themes from The Dybbuk to think about relationships between queer generations in the wake of the AIDS epidemic (“a love letter to the ghosts among us”), and Little Orphan Gender Revolutionary Annie – a 4-act song-cycle about the gender binary oppression of the girls’ orphanage, told through toy theater/green screen magic. Nepon is pursuing an MA in Goddard College’s Transformative Language Arts Program, and working on a thesis about New Yiddish Theater-maker Jenny Romaine and radical faerie theater-troupe The Eggplant Faerie Players. Visit: www.ezraberkleynepon.wordpress.com. Dan Fishback (C’03) is the 2012-2013 ArtsEdge Resident at the University of Pennsylvania, and his work includes The Material World (2012), thirtynothing (2011) and You Will Experience Silence (2009), all directed by Stephen Brackett at Dixon Place. Fishback has received grants from the Franklin Furnace Fund (2010) and the Six Points Fellowship for Emerging Jewish Artists (2007-2009). He blogs at thematerialworld.tumblr.com; his regular website is www.danfishback.com. This entry was posted in Activism, Community Building, Cultural & Cross-Cultural Studies, History & Political Science, journal-Writing and tagged Ezra Berkley Nepon. Bookmark the permalink.